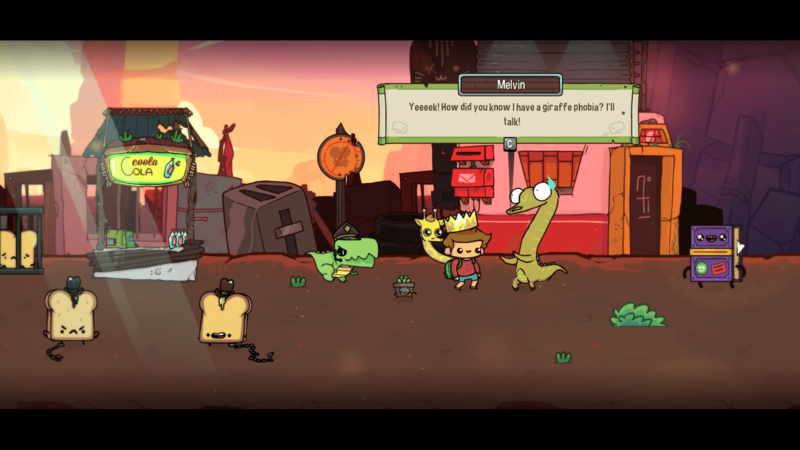 The Adventure Pals feels like what would happen if Adventure Time and Psychonauts were fused into a platformer. Developed by Massive Monster and published by Armor Games Studio, The Adventure Pals overflows with absurdist humor reminiscent of classic platformers; From its punchy writing to its diverse level design populated by everything from radioactive, sentient breakfast food to balloon-shaped lunar specters. And, while its mechanics could use some serious tightening, its gameplay from start to finish never fails to be satisfying. Every jump spews confetti out behind Wilton, the rambunctious youngster players control. The screen shakes and your controller rumbles with every bash of an enemy as you string together combos. And nearly every character and object have a bouncing animation when they stand idle. In a word, it’s pure fun. It’s up to Wilton and Sparkles (because what else would you name your pet giraffe?) to beat their way through Mr B.’s henchmen, and to collect enough rubies to thwart his plot. Progressing occurs in a predictable pattern which borders on tiring by the end of the game’s 10-hour campaign. You enter one of the game’s zones and unlock five platforming levels by talking to NPCs with quests that are tangentially related to your ruby-finding agenda. Like finding a giant stamp for an old man to keep the postman from eating his letters, which just happens to be next to a ruby. Or taking a crab’s totally not illicit funds to a bank surrounded by enemies who guard, you guessed it, another ruby. 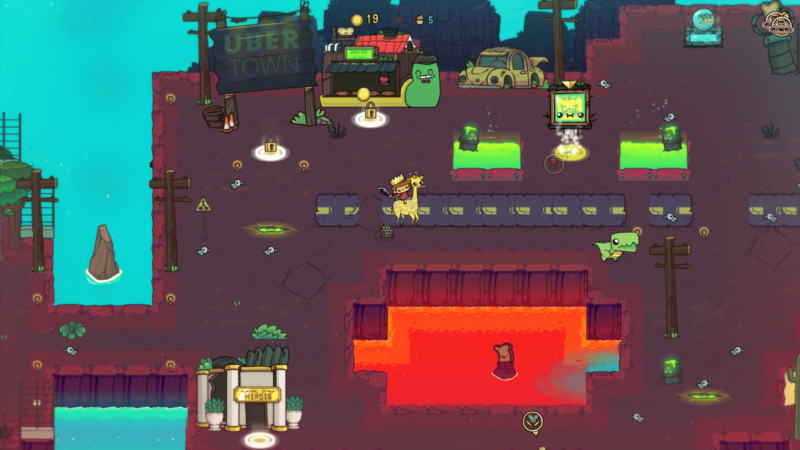 In between these adventures, Wilton rides his giraffe through the game’s overworld, cashing in collectibles, purchasing potions and bombs at each zone’s store, or battling in its arena. A 2-player mode lets a friend join the mix as well. Each of the five zones you visit are progressively weirder. Starting in a traditional forest, you travel to a beach city in the middle of a pirate election; then a landfill populated by sentient bread and a tyrannical dinosaur overlord names Tyrone; followed by Crab-lantis, a utopia sunk into the sea by their Queen’s obsession with collecting bowling balls; and finally to the moon, or rather, a necropolis version filled with ghosts. Who Knew a Giraffe Could Be So Multi-functional? These environments start out sparse, allowing players to concentrate on understanding each zone’s unique elements. As in most platformers, wall-jumping makes up the core component of traversing difficult areas. Sparkles helps with hovering, whipping her tongue around helicopter-style to slow your descent. She can also be used as a wrench to activate levers, manipulating the level layout. Mr. Rock – you can guess what he is – later joins your party and fulfills a similar function by hurling himself at far-off targets. As infectious synth electronica music plays in the background, you run around knocking out enemies, collecting stickers for your sentient sticker book, and snagging cupcakes to exchange for skins for Wilton and Mr. Rock. Exploring for those collectibles can be tricky, though, as it can be difficult to figure out exactly which way you aren’t supposed to go. That and the game’s fixed camera angle keeps hidden areas and spike pits alike out of view, with no way to tell which is which before jumping down. The game’s level design ramps up quickly after the opening forest zone, with elements like traps, lasers, and swinging physics added periodically to keep things fresh. Sometimes these difficulty enhancers can feel lazy, like small, slow-moving spikes on the wall that are so hard to see that it feels like more of a chore to avoid than a challenge. Other times they work exceedingly well, ramping up the difficulty with underwater sequences where you can’t attack, or a self-destruct timer, to add urgency to every action. 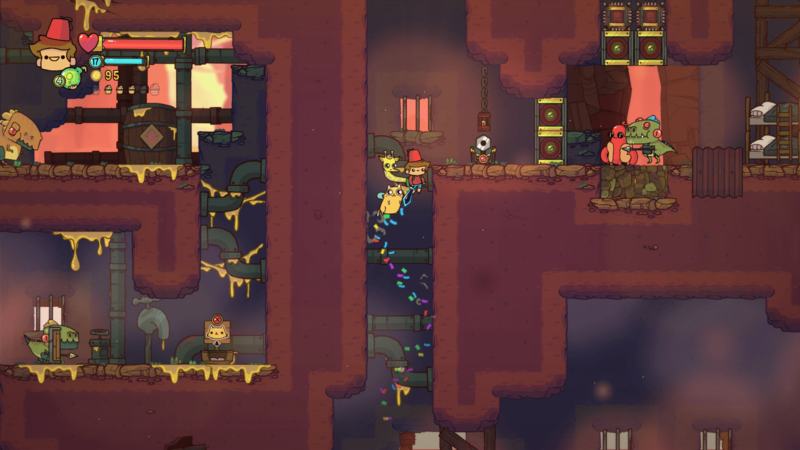 And when The Adventure Pals gets platforming right, it flows. Like when hitting a series of targets eliminates spikes just milliseconds before you land on them, or summons platform after platform beneath your feet as you climb. Or when Wilton ollies down humongous ziplines while sending bomb enemies soaring through the air in every direction, causing the screen to ricochet on every impact. Massive Monster shows its experience in this regard, as The Adventure Pals is hardly its first platformer. Where the game falters is in its attempt to merge platforming with beat-em-up style brawling. 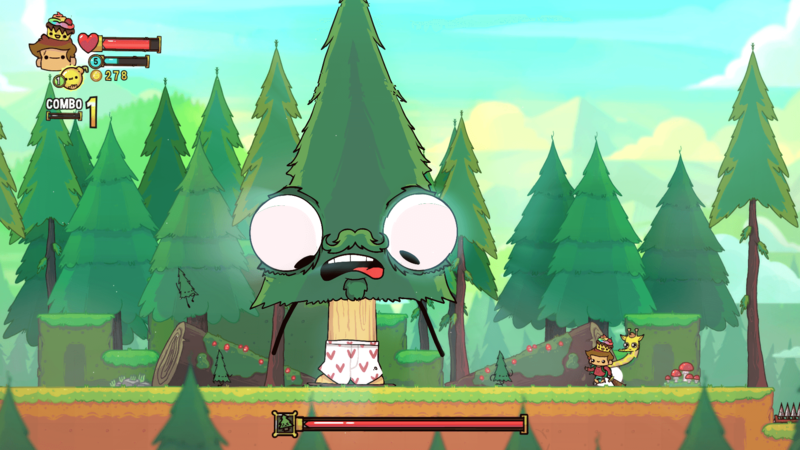 For its simple controls (a single-button attack), The Adventure Pals expects players to defeat huge numbers of hot dog monsters or Frankenstein forest animals at once, each varying in health, defense, and ability to be stunned. The game’s inventory is similarly overly simplified, with one button dispensing bombs and potions alike, forcing you to pause gameplay often to go back and forth between items. While leveling power-ups grant you and your companions abilities to assist in combat, these further complicate a frenetic battlefield that gets in the way of itself. For instance, a parrying blow often throws you back into another enemy’s down swing, or Sparkles will jettison Wilton toward a ne’er-do-well just as a bomb drops from one above. With so many enemies on screen, they begin to block each other’s attack animations, compounding fighting to an infuriating level at times. Several enemies later have shields to further hide their indicators. Even with all this, workarounds both intentional and unintentional plummet the game’s difficulty. An invincibility potion renders combat boring as you button mash with no need for strategy. Positioning yourself on certain ledges slightly above the fighting has similar results, keeping you out of reach of opponents but removing any skill needed to decimate them. What almost makes this forgivable is the game’s array of enemy creatures. 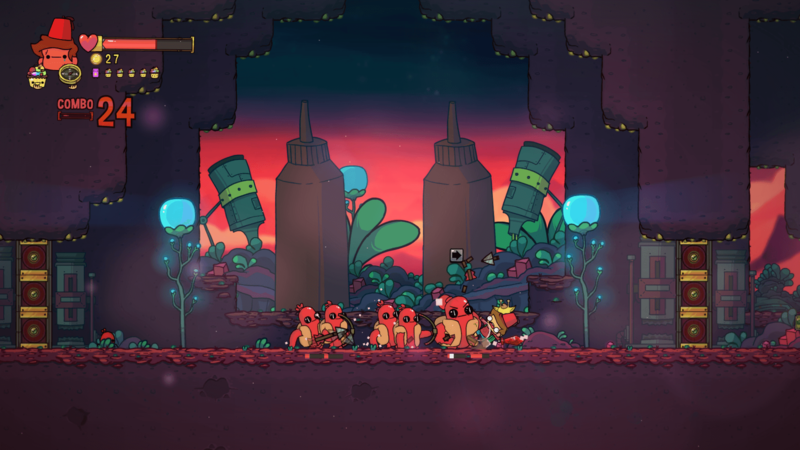 While they tend toward reskins in the beginning, the game’s second half overflows with diversity, from belligerent armadillos and blowfish to hot dogs that poop landmines. Even some of the reskins had significant improvements, like a radioactive slime that explode into smaller copies when hit. And while the final boss is on-par with other boss battles, it pales in comparison to the game’s final levels, which are downright vicious. Health-dispensing creatures and machine that create enemy shields transform every battle into a grudge-fest, where dozens of enemies descend upon you with melee and ranged attacks so fast that you’re dead before you know what killed you. But for how infuriating combat is, The Adventure Pals’ humor and writing make struggling through worth it. It peppers jokes during gameplay by subtly playing on your perceptions. Levers seemingly set up to void blocks in your way drop down enemies, or the obvious path to follow gets you trapped in a brawl to the death. As mentioned before, NPC quests gleefully jump over the line of absurdity. One of my favorites was in the pirate city of Port O’ Potty. The port’s resident whale is too shy to pursue their dreams of exploring the world because – gasp – they have nothing to wear! Once you snag them a fetching bikini, they return again and again with tales of their exploits, including a chance encounter with a certain doctor who gave them his iconic fez. And, of course, there’s plenty of fourth-wall breaking. 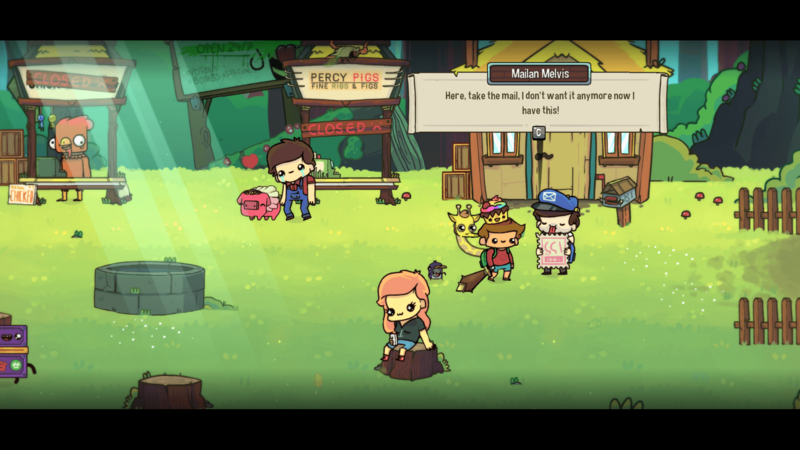 The developers mostly manage to avoid well-trodden ground, sticking to material that shamelessly digs at common gaming conventions. Like when a distraught Wilton yells “I’m way too upset for exposition!” at a crab prattling on about his city’s history. 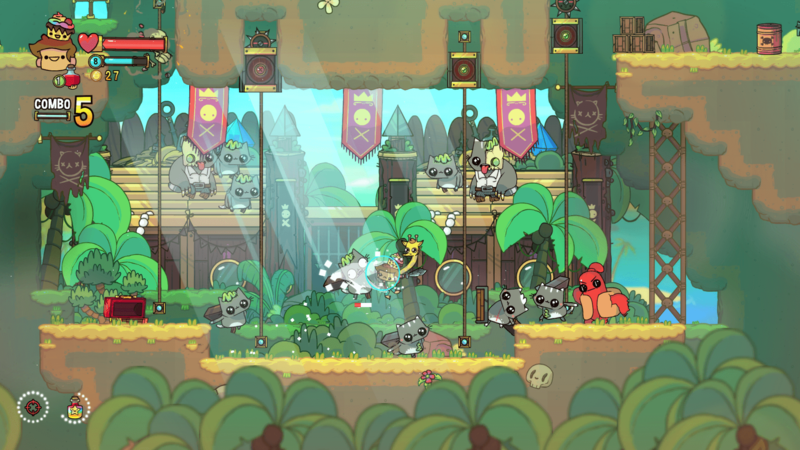 So, while The Adventure Pals fails to successfully integrate brawling mechanics into its otherwise tight platforming, it makes up for these shortcomings with charm and humor to spare. Impeccably written jokes break up its repetitive progression system, and a diverse range of level and enemy designs ensure playing never get boring. The Adventure Pals is available on Steam, Xbox Live, Nintendo Switch, and PS4. You can find all versions of the game on their website.